What explains firm performance? Although various metrics have been developed to measure firm performance, measuring firm strategy has remained a challenge. The authors suggest a novel manner of better understanding the effects of strategy on firm performance. They use an approach that innovatively combines three existing methods, viz bag-of-words text mining and analysis, latent space modelling, and conventional spatial econometrics, to arrive at conclusions. What explains a firm performance? “What explains firm performance?” has been one of the central questions in management research. A widely accepted perspective is that firm performance is some product of some characteristic factors internal to the firm (e.g., fi rm demographics, organisational structure, capital structure, etc. ), and of environmental factors external to the firm (e.g., industry structure, regulatory controls, macroeconomic conditions, etc. ), and of the firm strategy, which connects and reconciles the two. Although various metrics have been developed to measure a firm performance, internal factors, and external environment, measuring the complex, contextual and forever evolving multidimensional object called firm strategy has remained a challenge. b) The firm exposure to potential sources of risk. c) The need to estimate, interpret and statistically infer the marginal effects of firm strategy on firm performance. Our solution approach is to innovatively combine three existing methods, viz. bag-of-words text mining and analysis, latent space modelling, and conventional spatial econometrics, to overcome the three obstacles mentioned. We draw upon text analysis procedures popular in the social sciences to atomise the text into ‘phrase-tokens’ and thereby transform each firm textual strategy description into a vector of frequency weighted phrase-tokens in some latent strategy space. Next, we use relative firm locations in latent strategy space as an input to a class of spatial autoregressive models from the spatial econometrics literature, and thereby enable estimation, inference and interpretation of strategy externalities on firm performance. We label this approach as text-spatial modelling. We demonstrate our proposed approach empirically based on 2013 rankings (which in turn are based on 2012 data) of the Fortune 1000 firms. After dropping firms that are not public (and hence, whose fi nancial performance are not publicly available), we are left with 787 firms across 10 sectors and 132 industries. Both our firm performance measures hinges on fi rm fi nancial information for fi nancial year 2012 taken from S & P Compustat. To operationalise the strategy variables, we extract the text of fi rms’ 2012 Form 10-K fi lings with the SEC. We label as ‘BD’ (for ‘Business Description’), the text content of ‘Item 1 – Business’ in the 10-K. BD essentially describes the business of the company: what the company does, what subsidiaries it owns and what markets it operates in. We interpret BD as reflective of the strategic choice of product-markets and product-portfolios the firm chooses to operate in. Similarly, we label as ‘RF’ (for ‘Risk Factors’), the text content of ‘Item 1A – Risk Factors’, wherein firms describe potential risks, likely external effects, possible future failures to meet obligations and other threats disclosed to adequately warn investors and potential investors. We interpret RF as reflective of a firm expected risk exposure. Note that the assumption implicit here is that vocabulary similarities used to describe firms’ strategic choices of product portfolio or risk exposure correlate with similarities in firms strategies. A widely accepted perspective is that firm performance is some product of some characteristic factors internal to the firm (e.g., fi rm demographics, organisational structure, capital structure, etc.) and of environmental factors external to the firm (e.g., industry structure, regulatory controls, macroeconomic conditions, etc. ), and of the fi rm strategy, which connects and reconciles the two. We obtain a rich set of results. In the main, we find evidence that there exist externalities in a firm strategy in both product portfolio choice and risk factor exposure. In particular, we find that risk factor exposure explains 12.8 percent of the variance explained in firm performance (FP) whereas product portfolio choice explains only 5.5 percent. Hence, the results suggest that competitive strategy dominates industry choice in explaining firm performance. We also find that much of the strategy externality effect acts through other firms’ outcomes rather than their internal factors and (expectedly), that in firms which are similar in both product and risk space, the externality effects on a firm strategy are the strongest. (For the purpose of easy understanding we will call firms which are similar in both product and risk space as neighbours.) In what follows, we detail and illustrate some of the insights that emerged from the analysis. US firms are classified into major industry group or ‘Sector’, industry group, sub-industry groups and so on under the 1937 Standard Industrial Classification or SIC system. For illustrative purposes, consider a Fortune 1000 fi rm – Intel Corp. Intel belongs to the Technology sector and the Semiconductor industry. 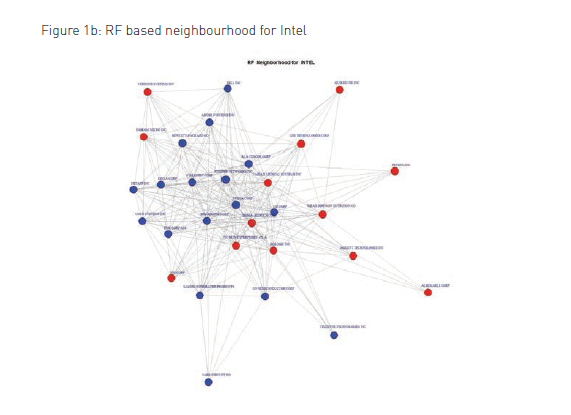 Figures 1a and 1b show Intel’s 30 closest neighbours in BD or product space and RF or Risk space respectively. i Strategy externalities appear to act across sector and industry boundaries. 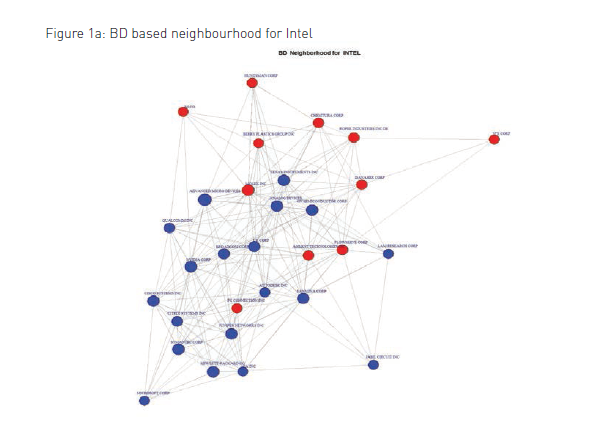 The blue coloured vertices are firms sharing the same sector as Intel and the red ones are from other sectors. ii The BD and RF ego-networks show some similarities but marked differences as well. A sizeable number of firms in one figure don’t feature in the other suggesting that the two latent spaces are indeed differentiated in function. iii Risk space appears to be more tightly knit (has higher centrality scores, in more technical terms) than product space. There are a number of ways in which firm strategy could influence firm performance. For instance, strategy could act through firm characteristics, such as firm size, and influence the performance of neighbouring firms (e.g., the larger a firm, the greater its effect on its strategic neighbours). A second possibility is that firms affect one another’s performance primarily through their own outcomes, i.e. one firm doing well (or not) affects whether or not other firms do well. A third possibility is that an interaction of two strategy spaces behaves in ways not captured by their standalone effects. We refer to these three possibilities as “modelled effects”, “SAR” for Simultaneous Auto Regressive and “SDM” or Spatial Durbin Model respectively. Further modelling choices and possibilities abound. For instance, one could argue that it is only one strategy space and not the other that affects performance. All these possibilities are testable provided the appropriate modelling specification is constructed and empirically implemented on data. The fi t of model to data (among other criteria) can help assess their claims to truth. The baseline model against which all these claims will be evaluated is the simple “IID” or Identically and Independently Distributed model which assumes a simple linear regression of performance over internal and external factors and zero effects for strategy. In all we test twelve different model specifications (four based on predictor subsets times three based on predictor type). Following our use of a generalised regression framework to estimate, the models, we use the adjusted R squared (adj R2) measure of fit. 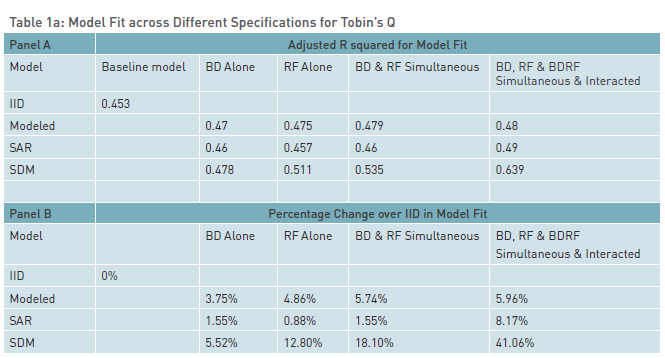 Panel A in Table 1a displays the adj R2 values of the baseline IID model and the twelve model specifications we estimate for Tobin’s Q. Panel B shows the percentage increase in penalised model fit for each model over the baseline IID model. 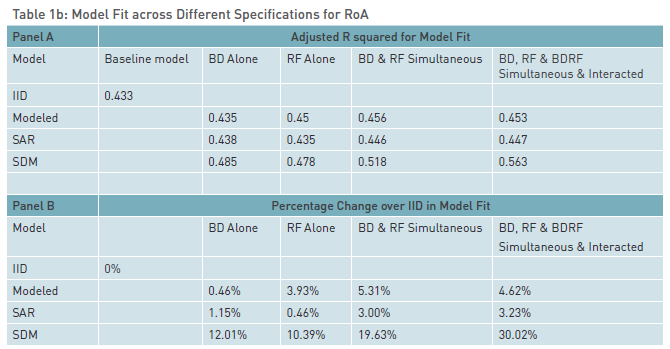 In Table 1a, the range of adj R2 goes from 0.453 for the IID model to 0.639 for the “full” model specification in the last column. Note that all twelve models show an improvement in model fit over the baseline, strongly indicating that incorporating fi rm strategy externalities improves explained variance in Tobin’s Q (and the RoA as per Table 1b). Tables 1a and 1b further suggest that while predictor subset matters, predictor type matters some more and the interaction between predictors matters even more. For instance, in Table 1a, we fi nd that RF dominates BD in its Tobin’s Q impact (the average rise in adj R2 is 7.24% for RF versus 4.60% for BD). Our solution approach is to innovatively combine three existing methods, viz. bag-of-words text mining and analysis, latent space modelling, and conventional spatial econometrics, to overcome the three obstacles mentioned. Thus, long-term fi rm value measures are influenced more by shared risk perceptions than by current product-market positions. But in Table 1b, for the backward-looking short-term performance measure, RoA as dependent variable, the order of predictor importance flips. BD (and hence, productmarket as well as industry choice) matters more than shared vulnerabilities across fi rm groups. However, in both cases, the largest increase in model fit occurs when the interaction of the strategy variables BD and RF is considered in addition to their main effects. This suggests that accounting for strategy externalities within that subset of firms with large concordance in both BD and RwF explains their performance differential in large measure and to a significantly greater degree than could have been done by BD and RF as main effects alone. Our interpretation of this phenomenon is that firms strongly similar in both BD and RF are “rivals” in the sense that they may represent substitutable resource and capability bundles. While the information in Table 1 suggests that externalities in strategy inform FP, it is of limited utility in explaining how the effect acts and what might drive it. At the outset, cross-firm strategy externalities in product and risk spaces could have a positive, a negative or a non-significant effect on any focal fi rm performance. The working paper carries more detail on the signs, magnitudes and relative importance of different firm characteristics in interacting with strategy variables, from the coefficients of the full SDM model that emerge. This analysis approach could help managers answer questions of business interest, such as: “Given my Form 10-K disclosures, who are my main competitors?”, “Which set of industries is my firm relevant to and competing in?”, “Which firms self-attested share my firm risk profile and exposure?” and so on. In sum, we address the problem of (i) extracting strategic content from textual descriptions of firm actions, perceptions and expectations, (ii) transforming this strategic content into econometric measures of firm strategy that are amenable to formal analysis and inference, (iii) developing a general model of firm performance as a product of firm strategy (among other antecedents), (iv)empirically implementing the proposed model on a large and diverse sample of firms. Through this, we provide a novel manner of better understanding the effects of strategy on firm performance and a method for assessing results of the analysis and understanding the implications therein. Ashish Galande is Doctoral Candidate in Marketing at the Indian School of Business. Prakash Satyavageeswaran is Researcher & Doctoral Candidate at the Indian School of Business.